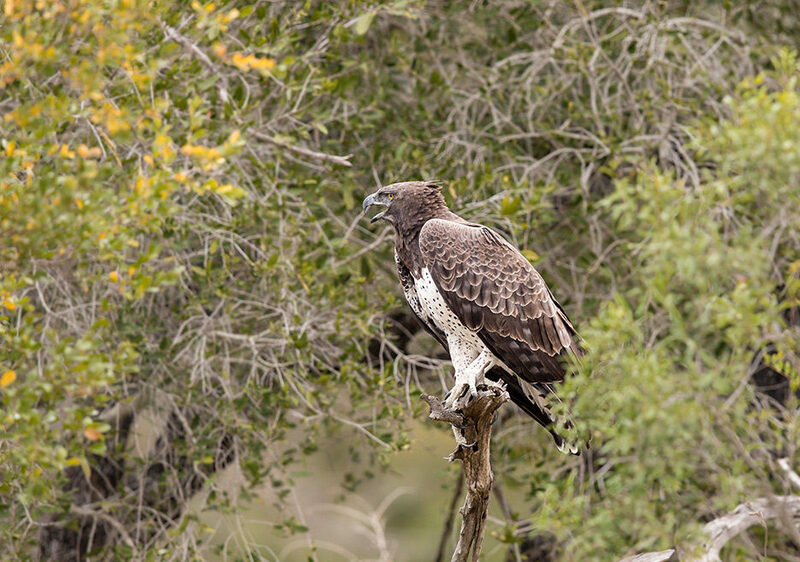 We had been driving along the Timbavati River road near the Leeubron waterhole in the Kruger National Park when my wife spotted a single Martial Eagle perched in some dense vegetation. 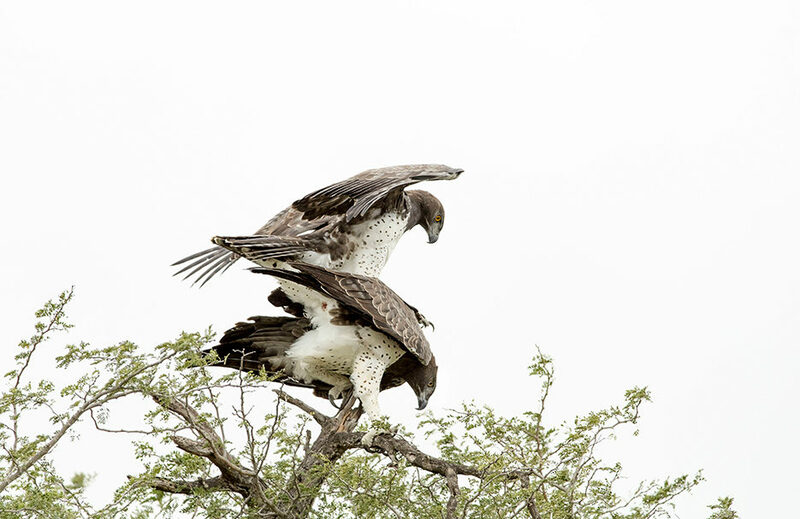 I captured a number of images of this eagle, although it was quite difficult to manoeuvre into a position that presented a clear view of the subject. I started out with a 600mm lens and then added a 2x converter to get a more frame-filling image. It was a large specimen of the species. Canon EOS 1DX Mark II with Canon EF 600mmf/4L IS II USM lens with 2x converter. ISO 800. 1/100 sec @ f/8 in Aperture Priority Mode. Evaluative metering. 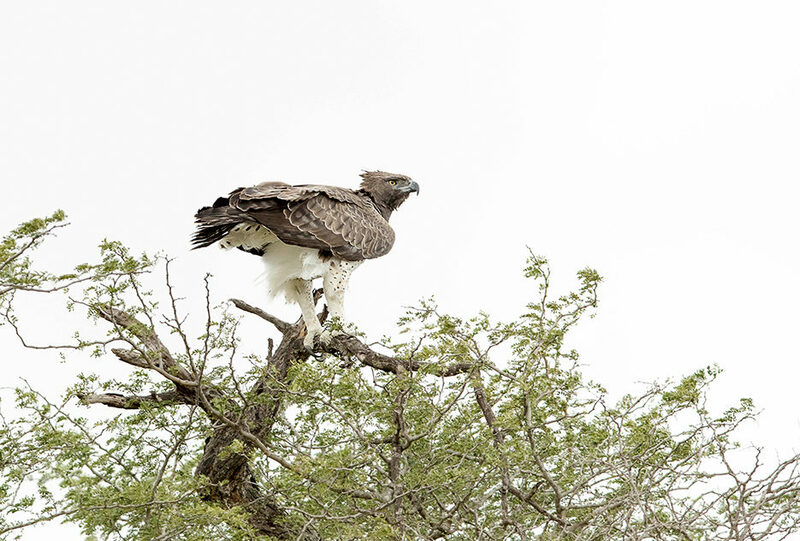 The eagle was constantly calling, which was the first time I had ever experienced a sound from a Martial Eagle. Canon EOS 1DX Mark II with Canon EF 600mmf/4L IS II USM lens. ISO 400. 1/160 sec @ f/5 in Aperture Priority Mode. Evaluative metering. I had anticipated that the eagle would fly off its perch so I had taken the 2x converter off. 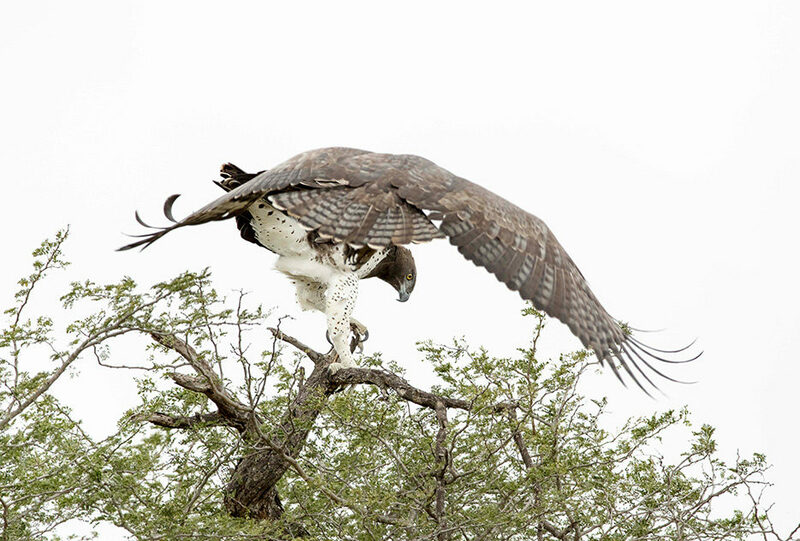 The eagle did in fact take off, but it was immediately obscured by the undergrowth. 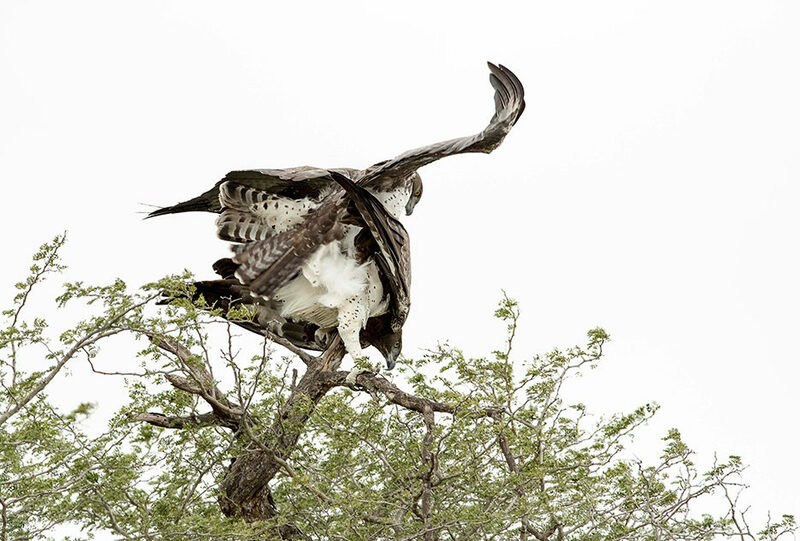 It flew to the other side of the road and perched on another tree – fortunately on an un-obstructed branch. The other very fortunate thing was that it was overcast as the subsequent images would have been captured into the sun. ISO 800. 1/640 sec @ f/5,6. Exposure set manually. Hand held. 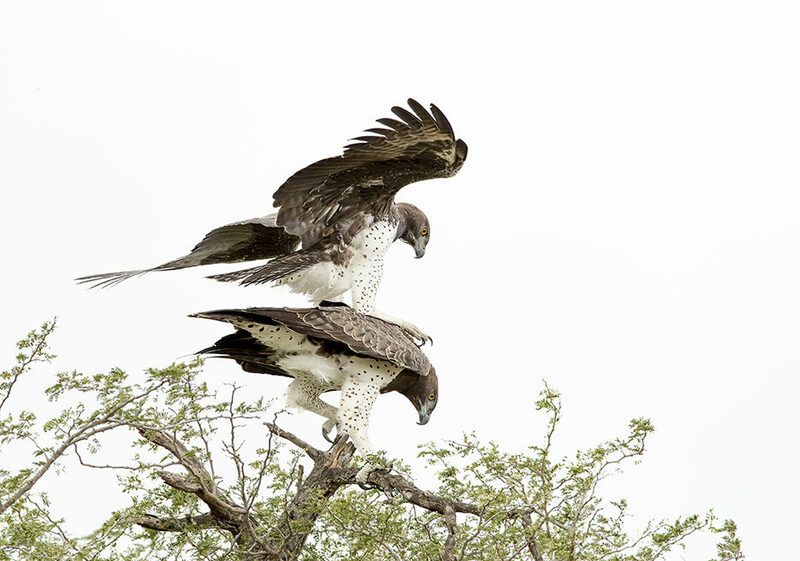 As I had moved over to the other side of the Land Cruiser to take some images of the eagle, I swopped to another 1DX Mark II which had a 200-400mm f/4L IS with 1.4 x converter engaged attached to it. This was the next most fortunate thing as a 600mm would probably have been a bit large to capture the subsequent action. I had just started to take an image – slightly adjusting the exposure because of the strong back lighting – when my wife shouted “here comes another one”! 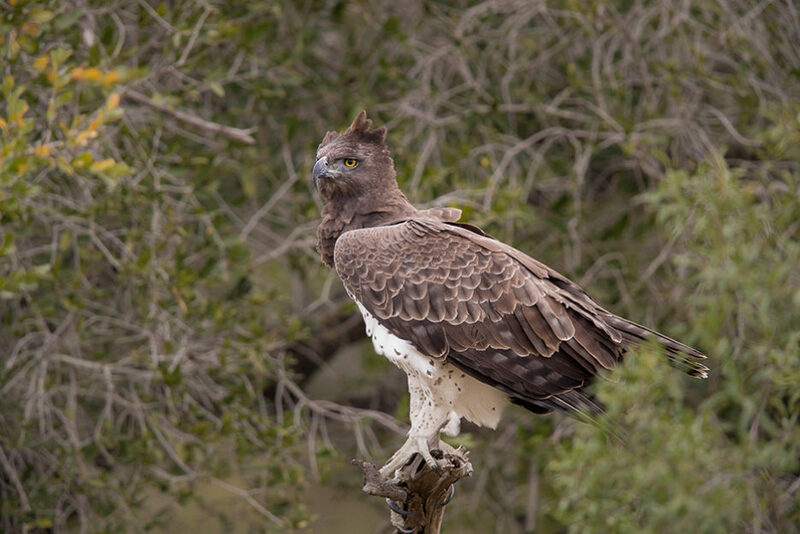 Just then another Martial eagle appeared in the viewfinder and I just hit the shutter button. All my camera bodies are set up with “back-button focusing”. The exposure setting was a bit underexposed as I did not have time to make any further adjustment. ( It needed some shadow recovery in Lightroom in the post-processing stage.) I was hand holding the camera at this stage. I then realized that this was most likely a breeding pair. 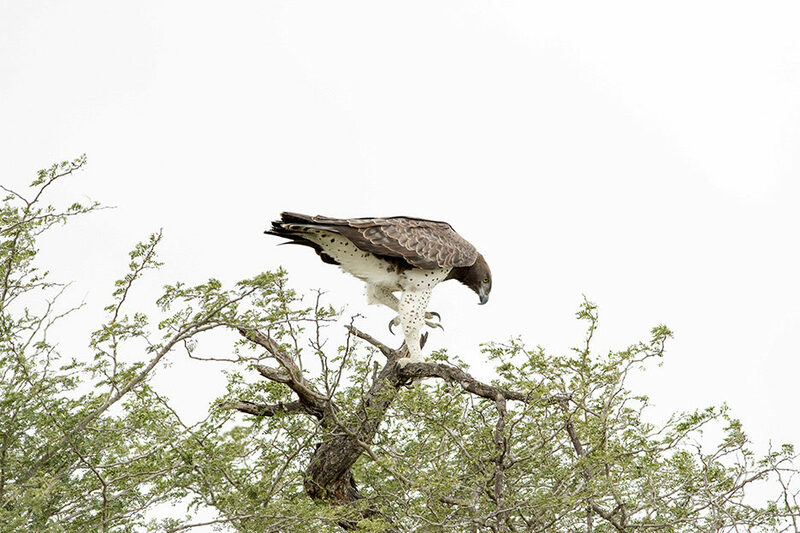 The female Martial Eagle is quite a lot larger than the male and the perched bird was the female that had just been calling the male. The male had responded! 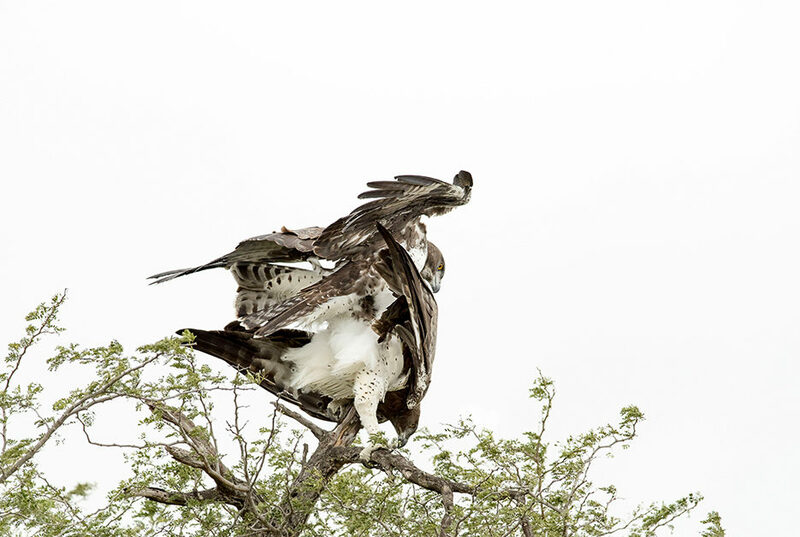 In total 88 images were captured from the time the male was arriving to the end of the sequence. This took only some 19 seconds. 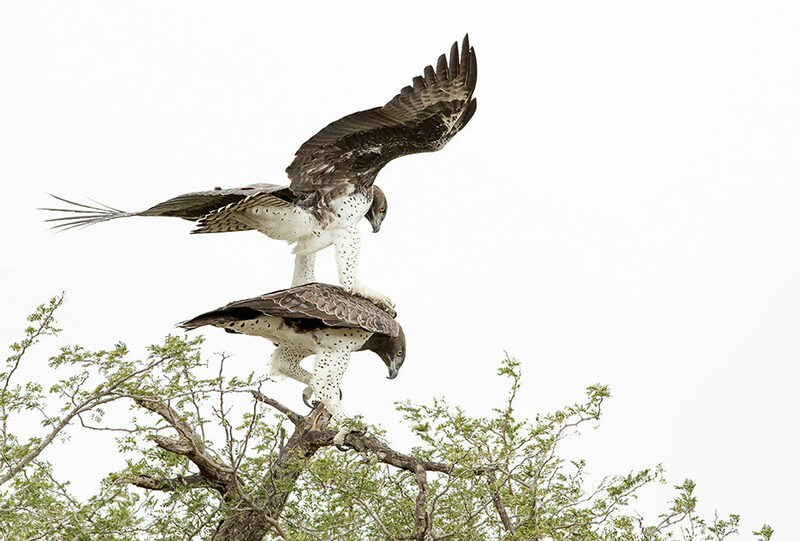 The female did not seem to have a very firm base on which to perch and was rather precariously perched with one leg a lot lower than the other, but her immense strength was soon evident. 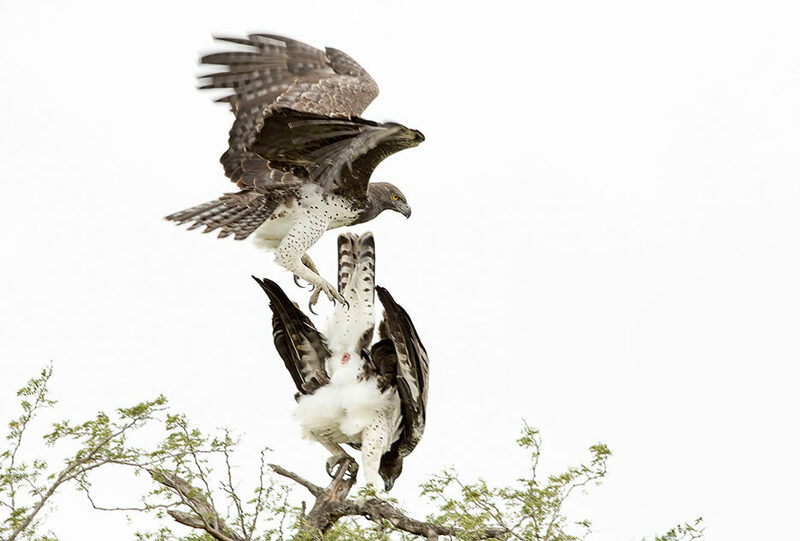 The male hovered over her and positioned himself to alight on her back without digging in his talons. The following three images show some of this manoeuvreing. This took up most of the 19secs of the whole sequence. The male then took flight and all that was left of an exciting and unique experience was a rather bedraggled looking female on the perch. This was just one of those exceptionally lucky encounters where most things worked in my favour as there was no time to really think other than to keep the focusing point in the right place. I did lift my finger from the back focus button a few times to try to achieve optimum focus and kept the shutter button going for a good bit of the time. Also a huge thanks to my wife who was driving, as she managed to get the vehicle in a very good position, not forgetting that she spotted the female first and also alerted me to fact that the male was entering the scene. I thought afterwards that better images may have been captured from a frontal view, but in retrospect the “backward to the side” composition probably worked out right. In any case there was no time to make any kind of change. Ek waardeer jou bedrewenheid met die kamera! Brilliant work John …it is all very well to be at the right place at the right time … but the wizardry still needs to be executed – which you accomplished par excellance! A big thumbs up to Madam driver, crucial to have somebody on board who understands what you’re trying to achieve. 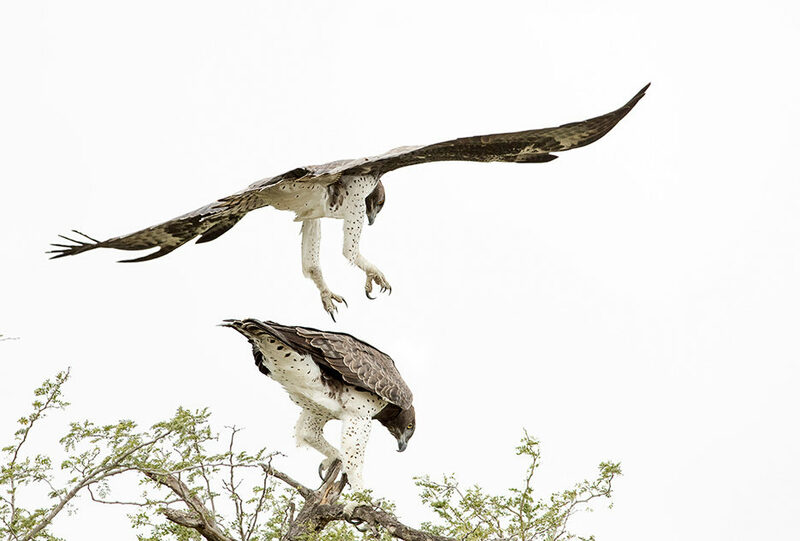 Amazing photos of incredible birds… well done! !